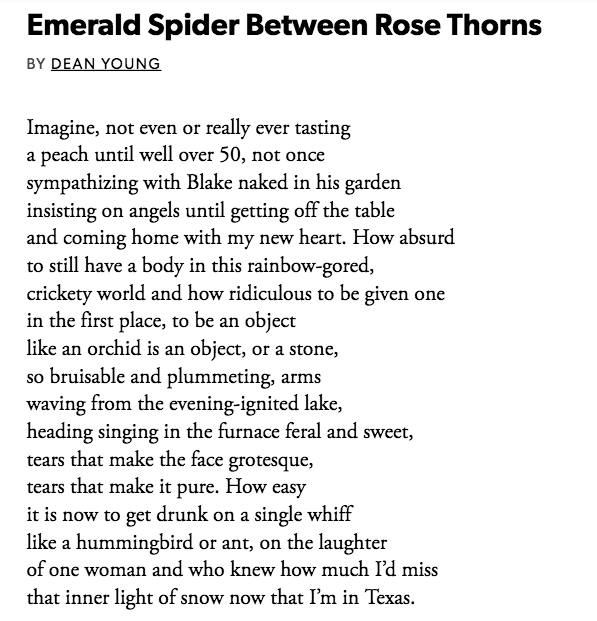 After reading four collections of his poetry (Shock by Shock, Skid, Elegy on Toy Piano, and Embryoyo) and picking up a fifth (Fall Higher), I e-mailed Dean Young about conducting an interview. Six weeks passed. He responded. Six more weeks passed. I responded. More than three months later and here we are. For the unfamiliar, Young is an inimitable poet and Pulitzer Prize finalist with a dozen poetry collections, one nonfiction book (about poetry), an MFA from Indiana University, and a suitcase full of prizes, fellowships, and awards that date back nearly three decades. His work is energized, hopped on coffee, insightful and sporadic, animated and tender. Like the Tasmanian Devil spinning whimsically through the desert and finding tranquility once soothing music is heard in the distance. With his forthcoming book of poems, Solar Perplexus, scheduled for 2019 through Copper Canyon Press, I decided to ask some questions about craft, Mary Ruefle, and (being against) writing prompts. In the interview, Young speaks on privacy, pocket pebbles, frustrations with academia, and his favorite place on the planet. How has 2018 been treating you so far? Can you name a particular highlight and a particular downside? The worst thing about 2018 was that it began and the best thing is that it will come to an end. Worst year of my life. And I’ve had some doozies. Of all of your poetry collections, which was the most difficult for you to write? I guess I would ask what’s meant by difficulty. There’s always the difficulties of writing, committing to it when there’s nothing there, getting it done. But that doesn’t seem actually difficult to me—some individual poems become devilments but not difficulties. Life is difficult so I could look back at individual books and say they come from, not necessarily represent, difficult times in my life but that doesn’t mean the book was difficult to make. Writing well is easy; it’s all the awful stuff one has to write to get anywhere that is difficult. The book that has been the most difficult to put together is the one I’m making now because my life has been wrecked. Throughout your bibliography, you have released a book (more or less) every three or four years. Since your last was in 2015, can we expect another sooner than later? Yup, a new book supposedly this upcoming year. Solar Perplexus. Although I really want to call it Die, English Department Die!!! 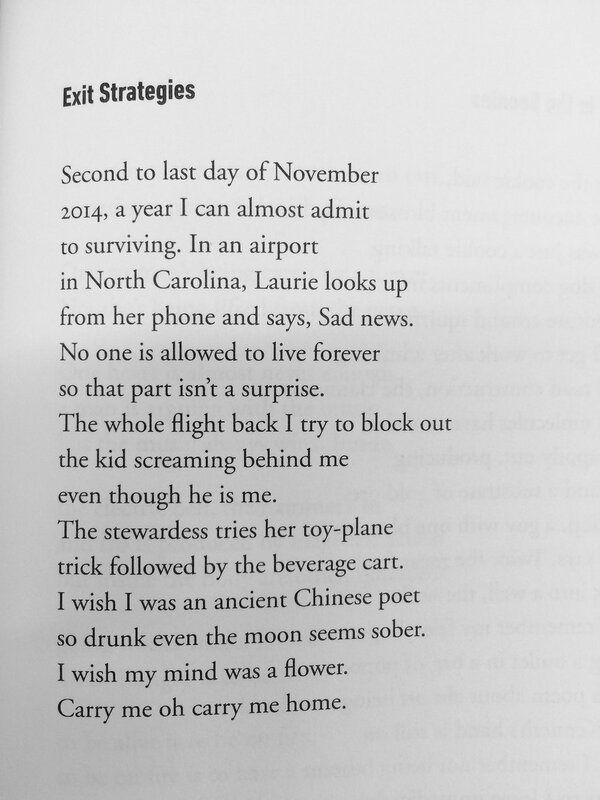 In Skid, Mary Ruefle wrote "A Poem by Dean Young." And around that time, you also wrote "A Poem by Mary Ruefle." How did this idea initially come about? Despite the end notes, did you expect these unique poems to throw off the reader? I’m not sure but I think it was me that suggested Mary and I give each other a poem for each other’s books. I flatter myself for feeling that there is a strong affinity between our poems. I hope there is as I’m certain that she is a truly great poet so maybe a little sparkledust flakes off on my poems. Honestly, worrying about throwing off a reader isn’t a high anxiety for me. It’s more an acceptance. What's your favorite place on earth? It can be as large as a city or as tiny as a closet. There’s a bluff near McClure’s Beach in Point Reyes where I once saw a whale. I was eating a Cheese Board baguette so it was almost like being at two of my favorite places on earth at once. With 2018 coming to a close, what is 2019 looking like for you? 2019 looks exactly like 2018 except for the 9. I like nines. If you can, describe your work space. What are some essentials while you write? I mostly work in cafes. One in particular here in Austin. I have my typewriter always on the dining room table where things are pushed to a more finished state. Right now I’m using a black Underwood from the early 60s. Paper, pens, and a typewriter. I fundamentally believe that people writing poetry on screens has led to an utter bodilessness of the line, has lead to at best scattered prose. During the semester, most of my reading is my students work. I always have Ashbery and Salamun with me. What are some of your hobbies outside of the literary world? I suppose my biggest and weirdest hobby is maintaining my privacy. If you were to empty your pockets right now, what would you find? Aside from the usual junk to identify the corpse, I usually carry three pebbles. Chrsocholla for my heart (one piece actually shattered by itself during a committee meeting), rainbow fluorite because it’s a creativity stone, and ocean jasper because it’s beautiful and supposedly helps maintain joy in complex situations. None work in the slightest degree. I’m a very umprompty writer and teacher. Prompts have a huge tendency to over-determine the poem. My basic prompt is to write your own damn poem. The one thing I would suggest to any writer is to read nothing on the internet, avoid all manifestations of the poetry world which has absolutely nothing to do with art. Don’t try to be a diplomat, don’t be a sell-out to English departments, resist the institutionalization of the art with its attendant frauds and self-interests. Read a lot; do not go to readings. Remember that poetry has been around forever and all you really want to do is be a conduit for it. Also know that poetry in this country has always been the province of the feeble-minded so now is not that unusual. Don’t worry about being a poet, just concentrate of writing poems. Don’t let social speech turn you into a hashtag ninnie. It all comes through the writing, the doing of it, not the talking about it or receiving vapid sticker stars from hood ornaments. The blood’s always fake but you got to try to make the bleeding real.